Aaaaand the final results are in. 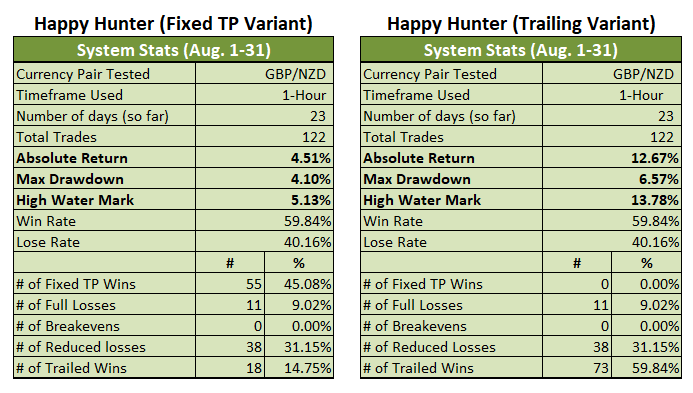 So, how did the two Variants of the Happy Hunter fare in August? Well, go ahead and click on the relevant jump links below for the deets. 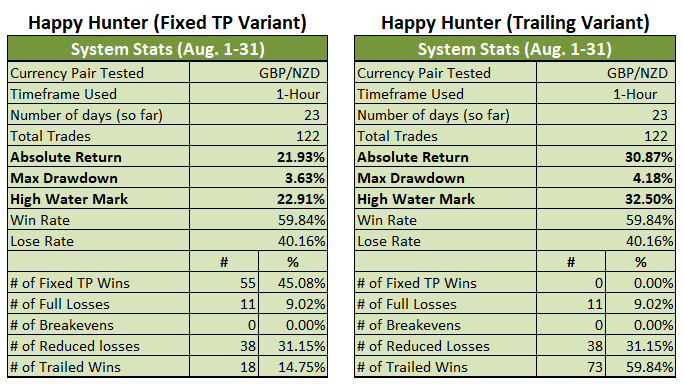 If y’all can still recall, July was the worst ever month for the Happy Hunter Trading System since both Variants closed out the month in the red, with the Fixed TP Variant down by 2.98% for the month and the Trailing Variant down by a more painful 3.62%. And if y’all can also recall, I was worried for the Trailing Variant since the losses suffered back in July meant that the Trailing Variant’s total profit for the entire testing period was only 1.09%, which is dangerously close to negative territory. 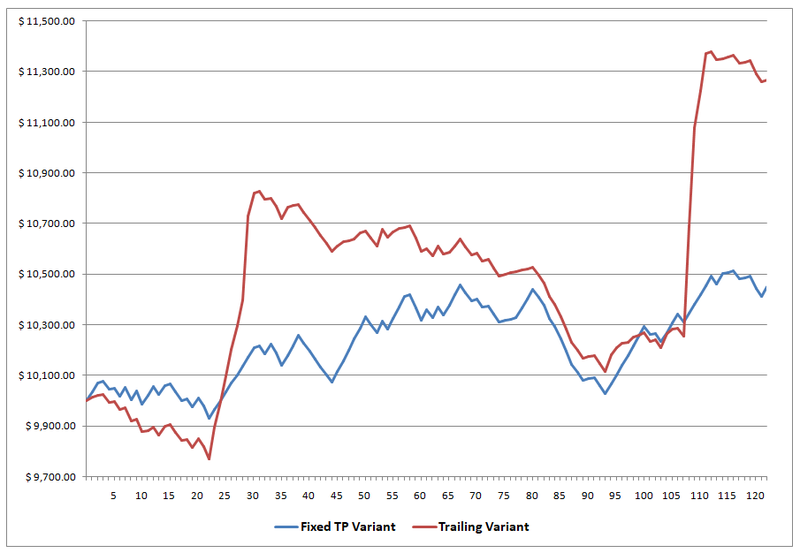 However, my worries were apparently ill-founded since the Trailing Variant significantly outperformed the Fixed TP Variant by a lot. A whole lot. 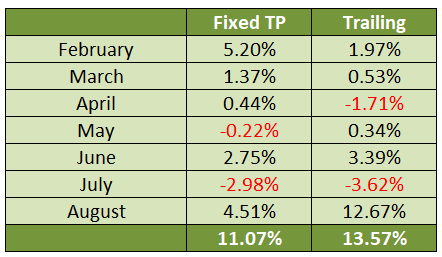 As you probably saw earlier, the Fixed TP Variant closed out the month with 4.51% in profits. In contrast, the Trailing Variant harvested a very impressive 12.67% in profits (note: returns already take spread into account). And the Trailing Variant can thank the burst of volatility on August 9, August 29, and August 30. Here’s how they look on a 4-hour chart, by the way. GBP/NZD’s bullish spike on August 9 was due to the RBNZ statement since the RBNZ revealed back then that it downgraded the projected path for the OCR to show a potential rate hike by Q3 2020, a full year after its original forecast for a rate hike by Q3 2019. As for the strong, two-day uptrend on August 29 and 30, that was due to Brexit-related optimism because of conciliatory comments from E.U. Brexit Negotiator Barnier. Anyhow, the gains harvested in August were more than enough to offset the losses suffered in July, so both Variants are now printing rather impressive returns after seven months of forward testing, with the Fixed TP Variant up by 11.07% for the entire testing period and the Trailing Variant up by a more impressive 13.57%. And as usual, here’s how the system would have fared in a fantasy zero-spread environment. 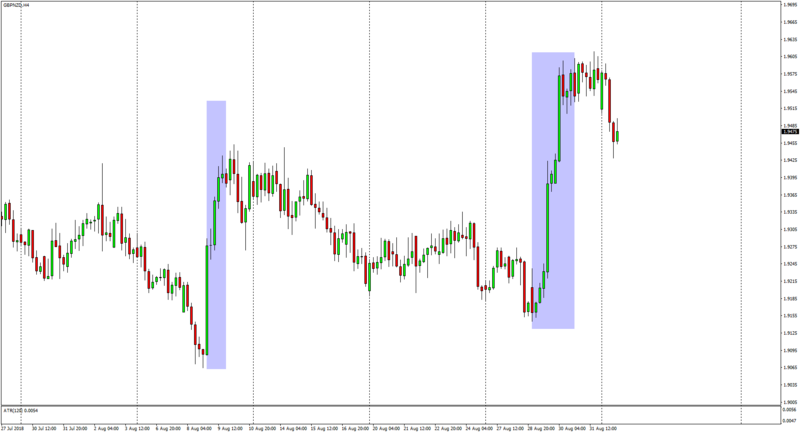 The fixed 12-pip spread assumed on each trade has a pretty big impact, huh? Anyhow, we’re not really out of the woods yet. If y’all can still recall, another reason why I was worried at the start of the month is that I was expecting July’s terrible trading conditions to continue. I’m pretty glad that my expectations were betrayed, but I’m still wary of the possibility that trading conditions may deteriorate again. After all, the pair has yet to break out of the ascending triangle pattern that I identified at the start of the month, which means that there’s a chance that volatility would tighten again. It would be really great if the pair finally breaks out, though. Anyhow, it’s time to give the actual verdict. And as a refresher, here are the main goals I laid down for the system when I first laid down my plans in My 2018 Trading Resolution way back in January. Again, monthly growth targets are not listed in my goals since the system is still in the forward-testing phase. Okay, time to give the verdict. 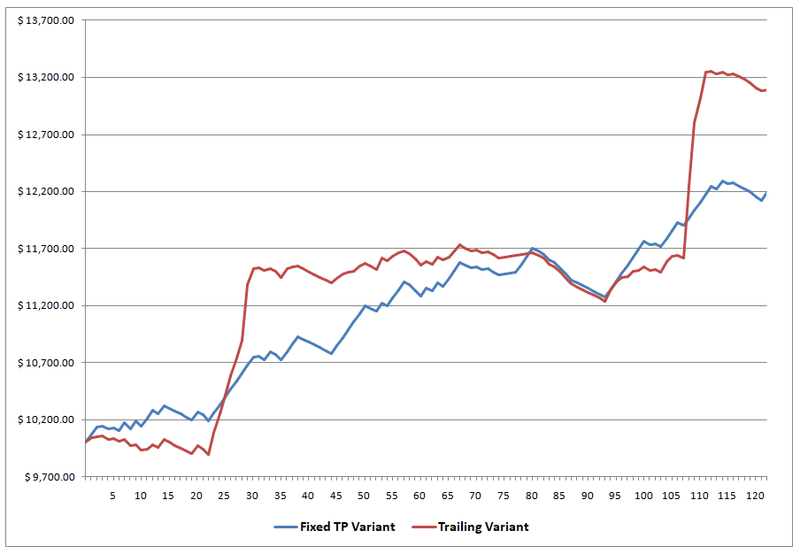 Both variants did not exceed the 20% drawdown threshold, so both Variants obviously met that goal. It’s also worth mentioning that both Variants have never breached the 10% “panic level” during the seven months of forward testing. The Trailing Variant did come close to reaching the “panic level” when had a max drawdown of 9.26% back in July, but that’s another story. Moving on, I’ll just skip the goal to have a reward-to-risk ratio of 1:1 or better since that’s not really applicable. It’s worth noting at this point that both Variants have a win rate above 50% again. They both invalidated my bonus goal to have a win rate that’s above 50% back in July, so it’s good to see that they are both meeting that goal again. As for the third goal, there was at least one trade per day in August, so we can easily check the third goal off our list. As for the fourth goal, that’s still in progress and we won’t know until next year. Both systems are well in the green for the year so far, though, so we will likely meet this goal. As for the fifth goal to have a winning month (each month, every month), well, both Variants already invalidated that goal long ago. To sum up, growth targets aren’t really part of my goal for the system, so the impressive returns generated in August are welcome but irrelevant. But in terms of my goals for the system, both Variants are still actually meeting my critical goals, well, except for the goal to have a winning month every month. I haven’t had time to work on trading system development in August. And the way things are going with my tasks, trading, and life in general, I probably won’t have time to do so in the foreseeable future. I’m therefore scrapping any future developments and Version 4.0 will likely be the last version of the Happy Hunter Trading System. I suppose I can roll out the original Version 5.0. However, it still has the system’s major flaw, namely the lack of filters, which translates to painful losing streaks during periods when GBP/NZD trades sideways while volatility is relatively tight. Anyhow, I’ll try to squeeze in some trading system development work whenever I can, but please consider development as halted indefinitely. 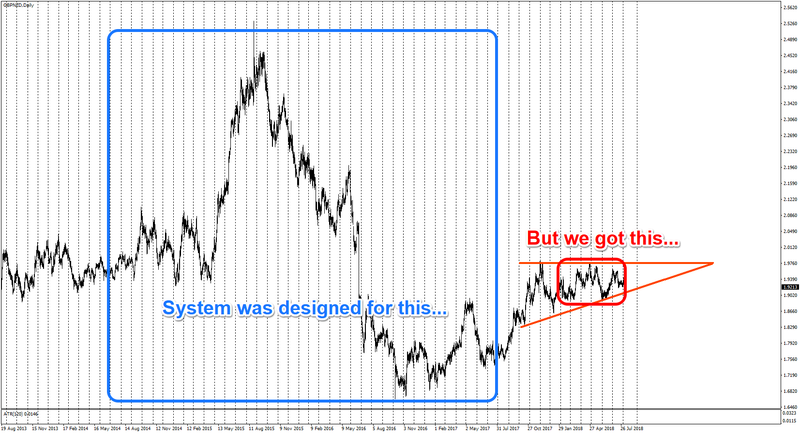 As it currently stands, the system is doing well enough, despite the terrible trading conditions. And remember, the system was designed for a different market environment – a market environment which we’ve only been getting glimpses of. 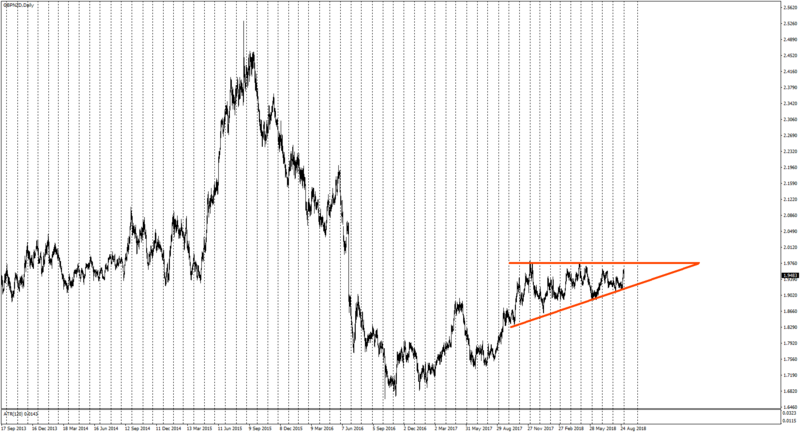 Just look at the chart below to get an idea of what I’m talking about. By the way, keep in mind that the small, red box is the entire forward testing period. Yeah, it really gives you a different perspective, huh?